Five teenagers encounter a family of homicidal, in-bred hillbillies. Marcus Nispel's surprisingly good remake of Tobe Hooper's 1974 horror classic The Texas Chain Saw Massacre was a rare cinema treat for fans of the genre, whose appetites have become dulled by anaemic and toothless teen shockers. Like the original, the film is remarkably gore-free, but has plenty of that most elusive cinematic ingredient: atmosphere. It lacks the sheer visceral malevolence of Hooper's 1974 film, but it does benefit enormously from the particular skills bought to the film by its talented German director, whose background, predictably, is in commercials and music videos. Following a naturalistic opening sequence, most of the remainder of the film has a deliberately drab palette, favouring sickly greens, and rusty browns: so the film works in terms of tonalities rather than colours. The film is deliberately pale, too, to evoke the film stocks of the period it's set in (the mid-70s). Daniel Pearl's cinematography, presented on the disc in 1.85:1 anamorphic format, is nuanced and rich in detail: two characteristics likely to ring alarm bells at any DVD authoring facility. Thankfully, whoever mastered this film has done a terrific job. Tonal range is excellent, and there's plenty of detail in the image. Light levels inside the house are low, and the darkness is often almost all-enveloping. For optimum effect, a well-calibrated display is essential, in a suitably darkened viewing environment. The film was shot in traditional manner, but the answer prints were processed with the contrast-enhancing bleach bypass process, rather than using the expensive and labour-intensive digital intermediate step that's becoming increasingly prevalent. Pearl mentions that using the digital intermediate technique would have added a quarter of a million dollars to the film's lean budget. Pearl confesses on one of the commentary tracks that he wasn't initially aware that the film's prints would be made using the bleach-bypass process, and admits that the opening scenes don't look quite the way he envisioned them. 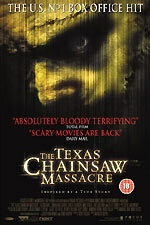 The Texas Chainsaw Massacre was made for just over nine million dollars, but looks a lot more expensive than that, and a lot of that can be credited to Pearl's excellent cinematography. It was Pearl, incidentally, who shot the original 1974 film. Since then he's been the Director of Photography on many Marcus Nispel's music videos, which is an odd twist of fate. There are no obvious apparent MPEG encoding artefacts, no distracting film flaws, and only a hint of artificial edge-enhancement. There are no on-screen captions, so no player-generated captions. The average bitrate is a high 7.96Mb/s, rarely dipping below 6.0Mb/s. The film has English subtitles, but there are no subtitles for the commentary tracks, or the bonus materials. The disc has fully-animated menus, which are appropriately atmospheric, and easy to navigate. One aspect which I found particularly convenient was that the menu music doesn't loop indefinitely. After you've heard it once or twice, the menus fall silent, which can be a blessed relief. The disc offers a choice of DTS (at 754kbps) and Dolby Digital 5.1 (at 448kbps) audio tracks. It should be obvious to anyone who samples both that the DTS track has a distinct edge, offering more delicate detail, and a more realistic sense of ambience. The mix is well-crafted, and often quite intense, but is deliberately not particularly elaborate. The sound mix is discussed in some detail on one of the commentary tracks. The dialogue, which includes a few thick accents, is generally clear and distinct from the other elements in the mix. On the review disc, there was an momentary glitch on the DTS track when Jedidiah tells the students his name (23m15s into the film). The film is supported by three composite commentary tracks. The first two (the Production Commentary and Tech Commentary) are include comments from several key behind-the-camera contributors, including the Director, Producer Michael Bay, and even the Co-Chairman and CEO of New Line, Robert Shaye, who has some interesting comments from his own, rarefied perspective. The third track (the Story Commentary) adds various cast members to the mix, including the very appealing Jessica Biel, and Andrew Bryniarski, who plays Leatherface. The Story Commentary is dominated by scriptwriter Scott Kosar, though, who fills in the background to the film, and explains the influence that real-life murderer Ed Gein had on the story. The contributions from the cast members probably amount to less than ten percent of the track. All three tracks are well worth listening to. Patching together contributors recorded at different times (some of them apparently grabbed on-set) is a somewhat risky approach, but in the hands of a skilful editor it's possible, as demonstrated here, to create something compelling. The tracks stray a little from being scene specific, but where they do it's usually to delve into a particular aspect of the filmmaking process in some detail (a discussion about the advances that have been made in on-set audio recording techniques since the original film was shot, for example). Each contributor is introduced each time they start speaking, which makes it easy to keep track of who is saying what. One of the highlights of the third commentary is Kosar's original idea for the film's finale, which would have featured a heavily-pregnant heroine being stalked through a slaughterhouse! Kosar also offers some interesting thoughts about how the genre might develop in the wake of the September the 11th attacks. Most of the bonus materials are presented in 1.78:1 anamorphic format. Tackling the bonus features in the order they're presented on the menu screen is not necessarily the best way of approaching them. They're listed here in menu order. Fourteen design sketches for Leatherface's mask, and photo's of potential make-up designs. This section is, more appropriately, titled Leatherface Concept Art on the American DVD. These two scenes would have book-ended the film. An older version of the film's surviving teenager, now in her 50s and incarcerated in an asylum, recounts her story to the authorities. Discovering that Leatherface might still be alive, a SWAT team descends on the family home. The on-screen title is Chainsaw Redux - Making a Massacre. This is an excellent documentary, which begins by looking at what made the original film such a success. It also acknowledges the prejudice any remake would have to overcome from the original film's enduring fan base. The documentary includes interviews, behind the scenes footage, excerpts from Nispel's music videos, and clips from audition tapes. A large chunk is devoted to the look of the film, and viewers may be amazed to learn that most of the film was shot on location, with a minimum of set dressing. There is also a section devoted to the make-up effects. You'll also get to see the cast members bonding, and ragging on each other, and on their Teutonic director. The only thing that seems to be missing are comments from the original film's director, Tobe Hooper, and the original film's cast members. The review disc had severe lip-sync problems throughout the Redux documentary. Anecdotal reports suggest that this has been rectified. A documentary about Ed Gein, the 1950s murderer who inspired Robert Bloch's Psycho, The Texas Chain Saw Massacre and The Silence of the Lambs. This is a relatively straightforward documentary, jazzed up with a few lurid illustrations and textural clips from the film. Contributors include Harold Schechter, author of many books on serial killers, including the 1989 biography of Gein, Deviant, film historian David J. Skal, author of The Monster Show - A Cultural History of Horror and Doctor John K. Russell, forensic psychologist. There are plenty of gruesome details here, and some truly horrifying photo's from Gein's Wisconsin house of horrors. Not for the faint-hearted! The UK disc, incidentally, has corrected an error on the US version's menu, which refers to this documentary as Ed Gein: the Ghoul of Plainville. Five deleted and alternate scenes, presented in anamorphic widescreen format, apparently in their final polished state: Alternate Suicide, Erin's News, More Erin and Kemper, Jedidah's Drawings, and Alternate Morgan Death. Note the spelling mistake of Jedidiah's name on the menu screen! These are an X-rated version of the suicide scene; two scenes in which Erin reveals that she's pregnant (a hangover from Scott Kosar's original story idea); Jedidah's Drawings, which makes the boy seem more normal; and a more squishy version of Morgan's death scene. Marcus Nispel discusses the scenes that had to be dropped from the film, for one reason or another. It's probably best to watch this featurette before the Deleted Scenes and Alternate Opening & Closing segments. Screen tests for Eric Balfour (late of Six Feet Under), Erica Leerhsen and Jessica Biel. Some of the Balfour screen test, and pretty much all of Leerhsen's, were included in the Redux documentary, but these are the uninterrupted versions. Nine conceptual design sketches, and a drawing showing how one of the death scenes would be rigged. A collection of American TV ad's. The presentation of the film itself can't really be faulted. Entertainment in Video's two-disc set contains a comprehensive collection of bonus materials, including three excellent commentary tracks and a feature-length documentary. The UK disc is also missing a few bits and pieces that are present on New Line's Region 1 version. Unfortunately this includes Michael Bay's infamous MPAA-banned "black" theatrical trailer, which is mentioned a couple of times in the bonus features. This is presented in its entirety on the US disc, but missing from the UK disc. Also absent from the Region 2 release are a music video (Suffocate, by Motorgrator) and the DVD-Rom supplements, which include a script-to-screen viewer (allowing the user to watch the film alongside the script), and some printable storyboards. The US disc also features a selection of New Line's theatrical trailers (Willard, The Butterfly Effect, Highwaymen and Ripley's Game) with Dolby Digital 5.1 audio.